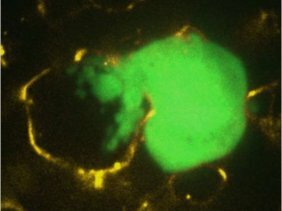 Before cancer cells (HEp3-GFP in green) extravasate, they tend to form these invasive protrusions called “invadopodia”. This is the first in vivo evidence of them and our data and images suggest that these are rather amorphous and bleb-like. We determine that inhibiting the formation of invadopodia disables the cancer cell’s ability to breach the endothelial layer. When this ability is taken away, the cells are unable to extravasate. The consequence of this is the inability to form metastatic colonies!